Owain Evans and William Saunders. This post explains the paper Trial without Error: Towards Safe RL with Human Intervention, which was authored by William Saunders, Girish Sastry, Andreas Stuhlmüller and Owain Evans. Deep Reinforcement Learning ("Deep RL") has made startling progress in Go, in Atari videogames, and in navigation and control tasks in realistic 3D environments. These milestones have come in simulated environments. Will Deep RL translate this success into real-world tasks? How can AI systems learn safely in the real world? Self-driving cars have safety drivers, people who sit in the driver's seat and constantly monitor the road, ready to take control if an accident looks imminent. Could RL systems also learn safely by having a human overseer? One challenge is that learning a simple Atari game can take RL systems 100 million frames. If a human had to watch over every frame, the training period would last more than a year! 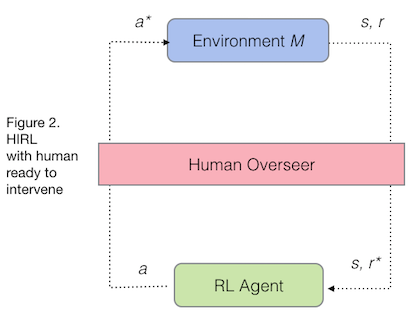 HIRL(Human Intervention Reinforcement Learning) applies human oversight to RL agents for safe learning. At the start of training the agent is overseen by a human who prevents catastrophes. A supervised learner is then trained to imitate the human's actions, automating the human's role. Gives the agent a negative reward penalty r* to negatively reinforce action a. The human's main role is to classify actions as "catastrophic" or "safe". Once the human has provided enough examples, we can train a supervised learner (which we call the "Blocker") to do the same job of detecting unsafe actions. The human retires and (if the Blocker has learned to imitate the human correctly) the RL agent is kept safe for the rest of training without human intervention. Here we discuss some challenges in applying HIRL to real-world tasks. Reward Hacking occurs when a reward function was intended to incentivize behavior X but some undesirable behavior Y also gets high reward. For example, Dario Amodei discovered that in a speedboat race game, an agent could get high reward by repeatedly knocking over some targets -- while completely ignoring the usual objective of racing around the course. Reward hacking occurs in Road Runner, where the agent gets more points by dying in a particular part of Level 1 rather than continuing to the next level. HIRL could be applied to fix or reduce observed instances of reward hacking if they can be blocked by a human. However, if the trained Blocker that takes over for the human is imperfect (i.e. some catastrophic action won't be blocked), then an agent with random exploration will eventually try that action. This happened in our Road Runner experiment. The agent killed itself by moving to the top-right corner of the screen and waiting for the coyote to get it (a way of dying that was not in the Blocker's training set). This is an example of a nearest unblocked strategy, where adding a penalty to the reward function to avoid a specific undesirable strategy leaves open a new undesirable strategy. Any application of blocking to prevent reward hacking must be wary of an agent learning another (more subtle) way to hack the reward. The human overseer can recognize and block all catastrophes. If this is too difficult for one human, a large team of humans can be used. This should be easy when overseeing a chatbot but difficult in domains with complex causal structure and time constraints (e.g. non-routine medical tasks). The time-costs of human oversight for training the Blocker are acceptable. This must take into account the issue of distributional shift (described below), which may increase the quantity and quality of labeled data required to train the Blocker. Further work, as described below, would allow HIRL to be used more cheaply and in a wider variety of situations. Distributional shift occurs when a machine learning algorithm is applied to data from a different distribution than its training distribution (violating the iid assumption). In HIRL, the training distribution of the Blocker is different from its test distribution. The Blocker is trained on state-action pairs encountered by the agent in the early stages of learning, but as the agent improves, it reaches new state-action pairs that it didn't reach previously. In our Pong experiment, distributional shift was not a problem due to the simplicity of the class of catastrophes. In Road Runner, the initial distribution on state-actions did not include all the ways Road Runner could run into the coyote and die. The Blocker was not robust to the shift in distribution that occurred more than 10 million frames later when the agent randomly hit upon these new ways of dying. How could HIRL deal with the problem of distributional shift? One possibility is to interleave periods of human and Blocker oversight. The human provides oversight until the Blocker has enough training data to safely take over. Then, once the agent starts to discover novel states, the human is called back and provides more oversight. This requires some robust way to detect when the agent is about to encounter new states: e.g. using anomaly detection or a robust measure of the Blocker's uncertainty. Such a system can have false positives (mistakenly classifying a familiar state as novel/anomalous) but not false negatives. Making a robust anomaly detection system is an open problem. In red teaming, a team of humans ("the red team") constructs examples of dangerous behavior that are designed to be challenging for the Blocker to classify. To test a chatbot Blocker, the red team would generate a wide range of offensive messages (similar to those a chatbot might produce). To test a self-driving car Blocker, the team would generate situations in which a car drives dangerously (e.g. driving off road or too fast) -- either using a private closed circuit (where danger to humans is minimized) or a very realistic simulator. The Blocker can then be tested on this set of examples to determine whether it correctly detects catastrophes. If not, it would be given more real-world training examples as well as adversarial training on the red team's examples. The red team would then try to defeat the improved version of the Blocker. Suppose one kind of catastrophes can only occur after the agent has trained for a long time (because it's in a hard-to-reach part of the state space). The red team may be able to produce examples of this catastrophe at some early stage of training. They could train the Blocker on these examples early in training and so the Blocker could take over from the human much earlier. A related approachis explored in Deep Learning of Robotic Tasks without a Simulator using Strong and Weak Human Supervision, where a "safety module" is trained based on human demonstrations of safe and unsafe behaviour. 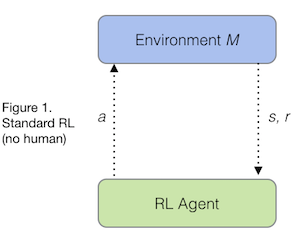 Off-Environment Reinforcement Learning is another related approach where the agent encounters many more (simulated) dangerous situations than they would in the real world. HIRL is related to Christiano et al's recent Deep RL from human preferences. In their paper, the agent starts with no information about the reward function and must learn about it entirely from human labels (which are provided asynchronously). In our experiments the standard Atari reward function specifies one component of the agent's rewards. The human overseer modifies this reward function online (synchronously), providing large negative rewards for catastrophes. In principle, the human overseer could specify the entire reward function in this way: HIRL can be used for reward learning from a human. Conversely, it's not possible to use the asynchronous human feedback of "Deep RL from Human Preferences" to avoid all catastrophes. The asynchronous feedback will occurafterthe agent has caused the catastrophe. Still, asynchronous feedback has various advantages. Evaluators get to see the actual effect of an action before evaluating it. They can play back the history at fast or slow speeds. And parallelization of human labor is trivial, since the history can be split up into different segments and sent to different human evaluators. 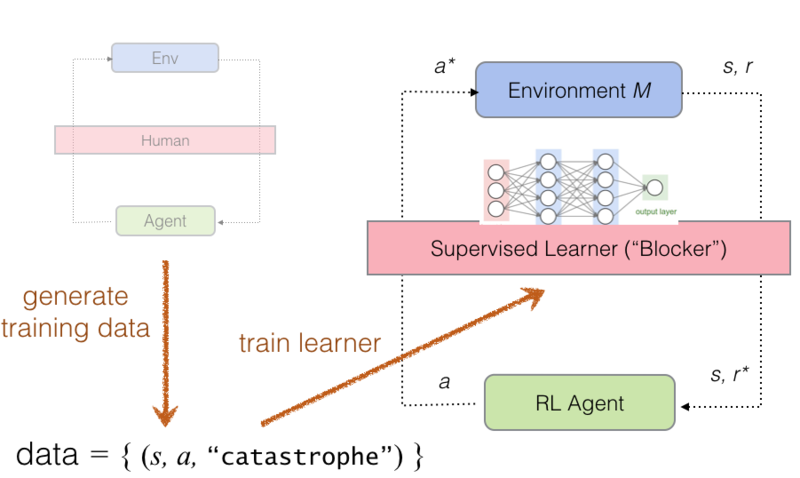 To make use of asynchronous evaluation in HIRL, we could relax our requirement of learning with zero catastrophes and consider a special "crash-test" training phase where catastrophes are permitted. (These would not be actual catastrophes but realistic simulations of them. For example, a self-driving car on a private road with crash dummies for passengers). If we then moved the agent into the real-world task, the human evaluation/intervention would need to be synchronous to prevent all catastrophes.